New apple and pear offerings from New Zealand shone at the first edition of the Vachamon Awards. Held on 22 September, the awards were a new concept from leading Thai importer Vachamon, which brought together the country’s top 100 wholesalers. 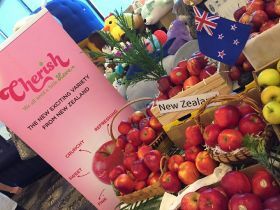 At its stand, Golden Bay Fruit, the biggest apple grower-packer-exporter on New Zealand's South Island, showcased Cherish apples and Piqa Boo pears. Cherish has already delighted Thai customers at Tesco Lotus this season, while Miranda, a new yellow-green apple with a surprisingly sweet flavour, is set to do the same from next year. While not yet exported to Thailand, the Piqa Boo pear’s bright red appearance and sweet flavour is also likely to appeal to Thai consumers once market access is granted. “Thai wholesalers are very curious about new varieties, and are always eager to know more about them,” said Julien Baumann, Golden Bay Fruit’s business development manager. "They were all attracted to the distinctive colours of our three main new varieties, but also pleased by their sweetness.